Space shuttle Endeavour is seen on top the overland transporter beginning its two-day, 12-mile L.A. road trip from Los Angeles International Airport to the California Science Center in the city on Oct. 12, 2012. In April 2011, NASA chief Charlie Bolden announced that the space shuttle Endeavour will spend its retirement at the California Science Center in Los Angeles. Museum officials have been preparing for Endeavour's arrival ever since, and they'll finally get their hands on the shuttle Saturday (Oct. 13). 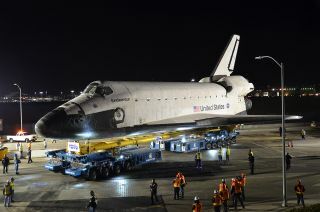 On that day, Endeavour will complete a two-day, 12-mile (19 kilometers) trek through the streets of L.A. from Los Angeles International Airport (LAX) to the Science Center, where it will go on display Oct. 30. SPACE.com recently caught up with Jeffrey Rudolph, the museum's CEO, to talk about Endeavour's historic journey from NASA's Kennedy Space Center in Florida, the shuttle's importance to the Science Center and the spaceship's ability to inspire the next generation of scientists and engineers. SPACE.com: How does it feel to be so close to getting Endeavour? Jeffrey Rudolph: It's incredible; we've dreamed about this for 20 years. From the day Charlie Bolden announced the award we've been excited, but somehow seeing Endeavour actually touch down on the shuttle carrier aircraft at LAX [on Sept. 21] brings a real sense of finality to it. SPACE.com: Are you nervous about Endeavour's move through the L.A. streets? Nothing like this has ever been done before — going through the middle of a big city with such a large vehicle. Jeffrey Rudolph: That's true. Of course, I think we'd be foolish if we didn't have concerns about everything on this, but what I'd say is that each day as we get closer and closer, my concerns are less. My biggest concerns were probably a year ago, when we were still figuring out what we were doing and how to make it work. All the plans are coming in place as we've laid them out, and everything's getting there. And I feel very good about the logistics of the move itself. The biggest unknown now is the people, and the crowds. We think and hope it will be a huge celebration and excitement, as the flyovers were, but you've got to be worried whenever you've got a lot of people around. SPACE.com: Do you have an estimate of how many people will show up for the move? And the extent to which that's shared publicly is really something determined by law enforcement. So we're watching that, and working with it. But with media following it, and social media, we'll see people all along the route. Anywhere they're allowed to be, they're going to be. There are a few places where the route is really tight, and we're doing some complex moves with this heavy machinery and equipment we're using to move it, where we won't want people there. But I think more places than not you'll see people along the route and enjoying it. SPACE.com: What's been the most challenging aspect of Endeavour's move overall, from Florida to the California Science Center? Jeffrey Rudolph: I think the move from the airport is the most challenging component of it. The rest is challenging because we had little time to bring in a lot of money to build our temporary home, the Samuel Oschin Pavilion, to put together a set of exhibits. They're good exhibits we're going to have when we open in Samuel Oschin Pavilion, but they're not the style of exhibits that you'll see in our long-term display [which should open in five years or so], and that typically our science center does. We just didn't have the time in 15 months to develop highly interactive, hands-on exhibits exploring science and engineering. So they're more traditional exhibits, although good ones. So that's all been complex, but the move from the airport is the thing that's never been done before. And that's taken thousands of people's efforts in the planning and execution of getting the route ready for this. SPACE.com: What do you hope people get out of the Endeavour exhibit at the museum? Jeffrey Rudolph: It really is about inspiration and motivation, and encouraging people of all ages — but particularly young people — to dream about the possibilities, to understand that when we set our minds to it and use our knowledge of science and engineering, we can do amazing things. SPACE.com: What is it about the space shuttle that inspires such excitement and emotion in people? Jeffrey Rudolph: I think it's a combination. It is an amazing machine, and the more people understand it, the more inspired they are by it, and the more they understand what amazing things we've done. But I think it's partially also this dream — I like to say that probably the earliest caveman would look up in the sky and see a bird fly by and want to do that. There's just this human desire to explore and to go where we couldn't otherwise go. Now you can do that with airplanes, but we want to go even further. I think there's a part of our human nature that makes us want to explore and go new places, and the space program really reflects that. It also reflects a real sense of pride. The patriotism that we saw a couple of weeks ago — I have people tell me stories of just not [normally] thinking that way, but when they watched Endeavour fly by, just feeling patriotic. We're the only nation that's done this. SPACE.com: What will Endeavour's impact be on the California Science Center? Jeffrey Rudolph: We think it will significantly enhance our reach. It will attract far more people, both from our region and beyond. I think it will change the nature of our audience to include more of a tourist audience. But more important is what we were just talking about, which is, it will significantly enhance our ability to accomplish our mission, which we word as to stimulate curiosity and inspire science learning. And this role of the shuttle that we've been talking about, how it has this phenomenal ability to inspire people and excite them, means that we can then explore the science, the engineering, the stories of the people behind it and engage more and more young people and others — we're all young when it comes to the space stuff is what we've seen — in science, and wanting to learn more. So it's about the best thing that we've ever seen to further our mission.